I think I’ll be at the Vancouver marathon. Want to walk a half with me? I’m jet lagged, but yes. My problem with commitment is when I say yes, I’m all in, so I’ve cultivated a lifestyle of avoiding the affirmative — those “maybe” buttons on Facebook are a godsend. But know; there’s really a binary person with a ton of judgment behind all those woolly maybes. Without a maybe I caught up in person with Esther after three and half years. We had first met at the Austin Film Festival (the Driskill Bar, naturally) in 2011. She was a force of nature then and remains so. The last time we crossed paths she gave me a swim routine (how to swim a mile faster) helping me negotiate the gloom of winter. Prior to I was only a fair weather pool fiend. Esther btw would have been a contender for Olympic gold if the 10km outdoor was available in her heyday — her 10km indoor being eight minutes faster than the current outdoor world record — and all the more remarkable because of a serious heart condition. She’s young enough to go back, but both her shoulders are blown, and frankly, she’s moved on, she’ll be on the Hill shortly helping shape tax policy. Early in the half marathon I noticed the pace. It was faster than my imagined slow. I made one quip and zipped it. The course took care of concerns. Knowing a course is a huge advantage; to me it was series of shorter walks, the vistas ever changing of glass, concrete, trees, and sea. Blue skies and cool morning air allied with jazz performers in pyjamas, official support and impromptu unofficial support eased the way. I smiled and wondered if I was as old and lame as I appeared to the young bystanders. Jesus, we’re only walking! Maybe it’s the act of walking and bringing up the rear in a race that makes the lameness a fair assumption. Not to be blasé — and it’s not the same — but I walk everywhere, and if I’m not walking, I’m cycling, and hey, I swim. Perhaps my three-week regime of eating every non-meat product in sight (a special nod to chocolate zuchinni muffins and chips) was telling. My runners were ten years old, my shorts twelve, both good enough for a 21.1km stroll and a little bit of air guitar. A pair of feet, what more do you need. Esther isn’t blasé. I had the privilege of offering notes on her memoir last year. It’s the #MeToo movement in book form. It’s a candid, heartbreaking and uplifting account of the three lifetimes she’s lived through domestic abuse, PTSD, and becoming the unlikeliest ultra runner ever, through which the memoir is framed. It’s extraordinary. I learned I could never truly understand what it’s like to have PTSD, and I’m okay with that because PTSD never goes away, its venom hovers around every corner ready to swipe your life away. To witness a force of nature, a life being destroyed through one cruel event after another, then rebuild, patchwork, to the realization of knowing she’ll be okay will never leave. We met at Austin because she’s a talented writer, a semi-finalist (in the Nicholl’s too) at the time. She would win another competition and be recognized by the top rung of NBC. All these years I wouldn’t know the hell she went through, and to a degree nor would Esther with her memories suppressed. And here she was in Vancouver, this expert on US tax code, motivational speaker, and mother, advising when to take electrolytes, to jog a little bit every mile to help the muscles, and decreeing the most important rule of all, jog when you see a photographer. Before the run, her partner asked me not to let her do anything stupid. As if I could. Bring on the Cheshire cat. After 21km I had to stretch the limbs and run. I assured her we’d cross the line together. I galloped away, plenty left in the tank (I swim, remember) and when I was done turned back expecting to see Esther a good distance away. Not a chance. We ran the last 50m together. Esther said I finished just ahead of her, the video disagrees. 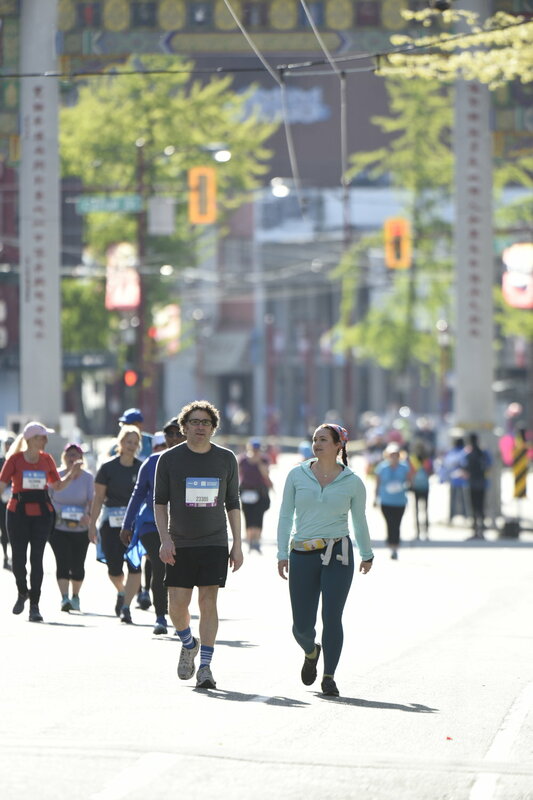 *Thank you to all the volunteers and the people of Vancouver for your support adding to the experience and notion of running the whole course next year.